Second expression of Nicholas & Mark. The post-modern cancels categories and classifications. Post-modern clothing is characterized more for the quality that it doesn't have than for that which it has. The meanings are unstable, mutable, contradictory and disconnected. In place of modern engagement in the development of a particular style, the post-modernist is interested in a pastiche of desperate indifferent aspects that in the end together produce something coherent. T-shirt worked like coats, coats worked like t-shirt, plasticized cashmere, merino pants mistreaded beyond the point of recognition. Short, long, and medium jackets in wool, in cashmere, in techno fabric. T-shirt with a deep scoop neckline embroidered with pearls and stones. Jacket with half-moon inset, wrap-closure with sash. Long, round-neck top with lettuce-edgeshorts sleeves. 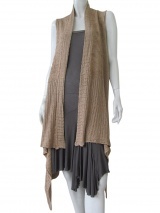 Short knit cardigan, dramatic shawl collar. The cheerfully face the heat of spring-summer. They face the cold of atumn-winter.